The fee will go into a new fund to support modernization, training, and improvement of the taxi and livery industry. What if every airline ticket you purchased, tucked amid all of the security fees, taxes, and airport facility charges, included a small additional line item: the Ocean Liner Support Fund, to help that industry stay afloat? Could a similar subsidy have saved cinema organists, minicomputers, or the Pony Express? That’s the kind of experiment Massachusetts is embarking upon, with a new fee on so-called transportation network companies, or TNCs, such as Uber, Lyft, and Fasten. When Governor Charlie Baker signed a law earlier this month regulating TNCs, it included a little-discussed component. For every trip, the TNCs will have to contribute a nickel to a new fund to support modernization, training, and improvement of the taxi and livery industry. The 5-cent fee will stay in effect until the final day of 2021. Is that enough money to help the taxi business endure or improve the taxi experience for passengers? “Too little, too late,” answers Larry Meister, who owns four Boston cabs and is the president of the Independent Taxi Operators Association, which provides radio service to about 300 cabs. “I don’t know how this nickel can be very helpful,” says Jim Endicott, who operates about 30 Boston taxis. Endicott points out that while cabs might be recipients of this new support payment, they pay many fees to access the airport taxi pool or subsidize transportation for the elderly in Boston that annually total hundreds of dollars per vehicle. 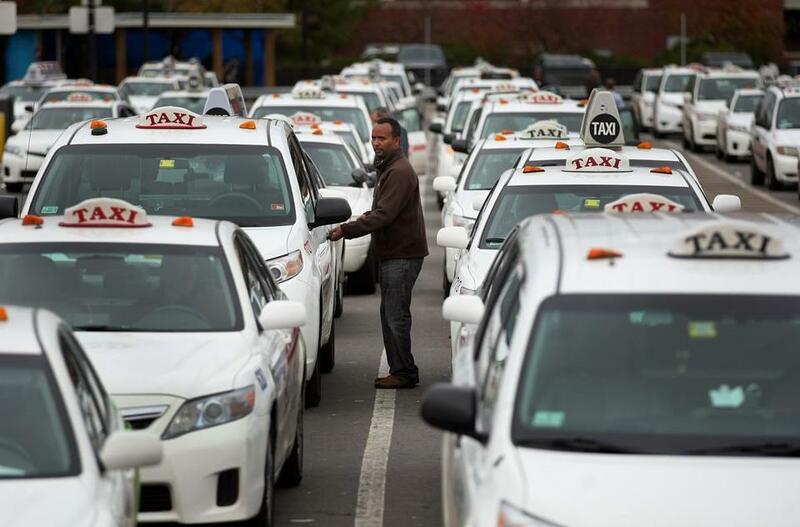 Number of annual Boston taxi rides since 2011, when Uber debuted in Boston. Except that now, they are. The money is going to be collected by the state economic development agency MassDevelopment, and it’s going to be spent on something. This past week, I asked people for ideas on how it could be spent intelligently. Rather than the Taxi Welfare Fund, what if we dubbed this pool of capital the Taxi Test Fund? The job of the individual overseeing it within MassDevelopment — and that person hasn’t yet been designated — would be to run an ongoing campaign to collect ideas worth testing from passengers, drivers, medallion owners, entrepreneurs, hotel managers, academic researchers, students, and so on. Once a quarter, a small review board would get together to evaluate which ideas were worth funding. The Taxi Test Fund would spend $100,000 at the outset to build a system capable of collecting feedback by text message, e-mail, or automated phone system about the experience of riding in an individual vehicle, with a particular driver, or using a specific cab stand. (It should also be able to collect feedback from drivers, too.) That’s important because without continuous feedback about what’s working, you don’t know which ideas to keep funding and which ones to kill. Two ideas came up repeatedly in the conversations I had during the week. The second idea mentioned a lot was an incentive system for taxi owners and drivers who offer exceptional service and better-than-average vehicles. Griffith proposes using some or all of the new funds “to create a service improvement reward,” or bonus, for the best-rated owners and drivers, using that new feedback system. Even though the TTF might only take in $2 million to $3 million a year for most of its life, by my estimate, that would enable it to hand out a lot of $2,500 or $5,000 bonuses to individual drivers who excelled, or even $25,000 or $50,000 bonuses to fleet owners who invested in, say, new shocks, nicer upholstery, or recharging the air conditioning system once in a while. Ben-Joseph, the urban planning professor at MIT, says more prominent taxi stands are one idea worth testing, in addition to an app that would be able to tell you how many cabs are available there. He also floats the concept of a “frequent rider” discount for regular customers or arrangements with big companies to provide discount service to their employees. An ongoing competition, and conversation, about ways to help the industry would probably elicit scads of other interesting ideas. What if you could easily request a cargo van from a cab company, with a driver willing to help with a small move or trip to IKEA? (Many people offer that service on Craigslist — with no guarantee of reliability or safety.) What if we actually put signs atop cabs to let people know if they were empty? Could the TTF help cab companies quickly evaluate the best new driver scheduling software or other new technologies? Could you help interested medallion owners acquire some “flagship” vehicles, like a 1940s Checker or a brand new Porsche Cayenne, to add some glam to the industry? Rather than a “think tank” conducting analysis, the TTF should be a “do tank” actually trying things to help the industry. And some of those things, like allowing new types of vehicles on the road, offering discounts, or installing cool new taxi stands, would require two or three municipalities willing to loosen their taxi regulations a bit to allow this sort of experimentation. “This is a hard problem,” says Len Schlesinger, a professor at Harvard Business School and a former chief operating officer of Limited Brands, which owns Victoria’s Secret and Bath & Body Works. He notes that cabs still operate under a much tighter regulatory infrastructure than the TNCs. But, he says, “I think experimentation is much better than trying to come up with the right answer.” And experiments might benefit not only the taxi business, but also the people who submit ideas for testing, especially students, entrepreneurs, designers, and academic researchers who would have access to a real-world testing ground. Also, they’d benefit the governor and legislature. This kind of support fund hasn’t been tried elsewhere in the country, representatives of Uber and Lyft tell me. Perhaps the elected officials who invented this tiny fee to placate the industry hope that everyone will just forget about it. But if you’re collecting cash, I think you should try to do something constructive with it. And despite my cracks about the Pony Express and ocean liners, I do think taxis can still play an important role in the life of a city. We should use this money to dream up and test 50 ideas — that’s just 10 a year for each year the fee is in existence — in the hope of finding a handful that might help drivers, passengers, and medallion owners.